Surrey—From 14 to 17 April, Sikh Research Institute Canada (SRIC) worked closely with community groups, local media and the Lower Mainland's Gurdwaras to host numerous events that built awareness of the inspiration and message of Vaisakhi in both the Sikh and non-Sikh communities. Vaiskahi is historically a harvest festival in Panjab and also marks the day that the Khalsa was inaugurated by Guru Gobind Singh, which formalized the call to Sikhs everywhere to fight against injustice, caste discrimination, sexism and patriarchal hegemony. Vaisakhi celebrations are thus an opportunity for Sikhs to revitalize their commitment to break down prejudice and hostility, and to join with others—Sikh and non-Sikh—to work together toward healthier local and global communities. Local BC Sikhs noted that, for years now, Western Canadian Sikhs have borne the brunt of negative and sensationalized media attention, that comes to a head around the time of Vaisakhi. Some from the area said that they feel as though a shadow is cast over the community every year, when the press reinforces negative stereotypes and there is no opportunity for intra-community dialogue. In light of these sentiments, SRIC volunteers made it a goal to design a weekend of programming which would reach as many Sikh and non-Sikh community members as possible this Vaisakhi, paving the way for celebrations in the city to take place rooted in tolerance and education. In order to facilitate the much-needed dialogue, SRIC planned two forums to take place on 14 April. 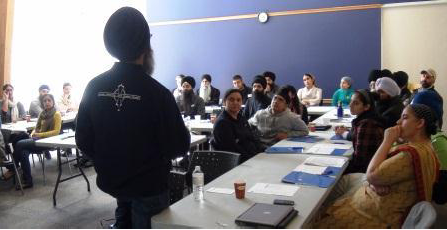 The first, “Understanding Vaisakhi,” was organized specifically for Sikh and non-Sikh public leaders in the BC-area, and was attended by representatives from city government, politics, law enforcement personnel, educators and community organizers. Harinder Singh, SikhRI’s chief programming officer, led the presentation, giving a general overview of Sikhi, its history and traditions, and then focusing on Vaisakhi and its cultural significance to Sikhs today. His talk inspired an active Q & A period where attendees were able to voice both their appreciation for the event and to clear up misconceptions or misunderstandings about Sikhi. "[It was] both a thought-provoking and informative presentation. The true meaning of Vaisakhi and the principles upon which it was founded became clear to us for the first time. It was an excellent opportunity as Muslims, to learn more about the meaning behind the traditions and practices within Sikhism,” said Dr. Alim Hirji. “It also served as a motivational push for members of all communities to reach out to individuals in need, and to encourage all to speak out for the individuals in our society who are voiceless and in need of equal rights and representation." 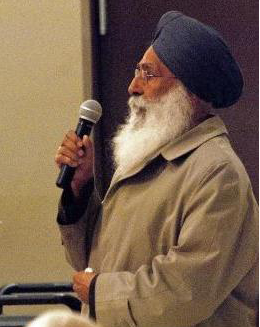 Later in the evening, a second forum was held, “Vaisakhi: From Panjabi Festival to Sikh Ideals,” which was specifically organized for the non-Sikh community of the Lower Mainland. Attendees were encouraged to ask any questions they had about Sikhi or Vaisakhi, and to join in a discussion of the issues that Sikhs feel they face often when called to respond to negative portrayal in the media. 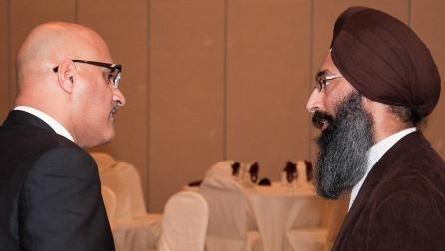 In addition to the forums, Harinder Singh gave an interview on Omni TV on the topic of “Understanding Vaisakhi.” He also spoke on two radio programs, the Harjinder Thind Show on RED FM and Dilaan Di Sanj, hosted by Kuldip Singh on Sher-e-Punjab Radio. He also gave interviews on Apna TV and 'Dhoop Chaon' which aired the following week. Additionally, there were other events that weekend designed especially for the Sikh community hosted by SikhRI. On 16 April, Inderpreet Singh, a member of SikhRI's Board of Directors, presented a Liv Webinar, “From Panjabi Festival to Sikh Ideals.” Later that same day, Newton Library’s multi-purpose room was packed with almost 50 attendees, who came ready to engage in an interactive community-development Saneha workshop, “Guru Khalsa Panth.” The busy day covered topics such as “Khalsa: Characterisitics and Behaviors,” “Developing Consensus the Sikh Way,” and “Gurmatta and Maryada.” The workshop was facilitated by both Harinder Singh and Inderpreet Singh. Kirpa Kaur said that she and the other volunteers felt that the response to this year’s programming was very clear: BC wants more accessible cultural education. She said that her team is excited to bring more events to the area in coming months, and to make the Vaisakhi forums an annual occurrence.